Everyone on Hannibal is wounded or dead, and the blood is pooling. Blood is an image that appears over and over so far this season — in a wine glass, a bathtub, all over Hannibal’s dinner table. When Hannibal was still concealing his true self from Will, his atrocities were committed off screen, but there’s no hiding anymore. Like a snail leaving a trail of ooze, Hannibal leaves a path of blood and death behind him. “Will died,” Jack says, and for a moment I thought of course he did, we’re imagining all of this. But Will is still alive (I think), and he was able to put his imagination back together. Will’s imagination is stronger than ever this season, and it’s even more difficult to tell what is real and what isn’t. His daydreams of Abigail seemed real for a while because I wanted them to be, and because I created a story to allow me to believe what I wanted to believe. This season of Hannibal is all about telling stories. Fairy tales, folk tales, and the stories we construct to allow us to go on with our lives are all part of the framework these characters are operating in. And really, when tragedy strikes, what else can you do but pick up the pieces and try to make sense of them? There is no logic or order to death and loss, but humans try to create logic and order from it anyway. “All sorrows can be borne if you put them in a story,” Chiyoh says to Will. And so Will continues his investigation (which is just using evidence to construct a story, after all) at Hannibal’s childhood home. The binoculars he uses to keep him at a safe distance from the estate are just an illusion — he’s already so deep into Hannibal’s psyche, he’ll never escape. While sneaking around the grounds, he sees Chiyoh out hunting. Will hunkers down behind a tree to avoid finding himself in her crosshairs as if he were the prey. It’s always been difficult to tell who is the prey and who is the hunter on Hannibal, and these lines are continuing to blur and cross, and cross back again. Bedelia is no longer observing and is fully participating as she pulled the ice pick out of the professor’s head, becoming the person who — technically — killed him. Hannibal loves technicalities so he can stand behind his manipulations as he influences others to kill. Will may have stumbled on Hannibal’s very first manipulation when he finds a graveyard with a tombstone for Mischa Lecter, Hannibal’s sister, at the Lecter estate. The other horrors Will finds are all too familiar: a man wrongfully imprisoned for murdering a young girl, a woman tricked by Hannibal into believing that prisoner is a murderer, and two people set up to be trapped in each other’s lives where the only way out may be to kill the other person. The horror imagery is strong this episode, with graveyards, close ups of stone angels, and blood pooling on a dinner plate. The faces of the characters are literally front and center as they meld into each other, as their pasts, thoughts, and emotions are all intertwining. 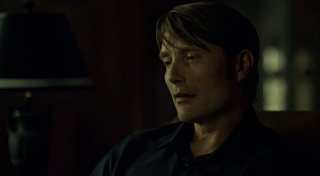 Hannibal’s face becomes Will’s face, and Will’s actions become more like Hannibal’s (or is that all the other way around? ), and Will sets Chiyoh’s prisoner free. This man, of course, comes back to his prison to try to kill his captor, as Will has tried to kill Hannibal, the man who imprisoned him. Jack is back, in a storyline a few steps behind Hannibal and Will. Jack is searching for Will, Will is searching for Hannibal, Inspector Pazzi is searching for his Il Mostro, and everyone is a little bit lost. Secondo is the second course of a formal Italian meal, and it is made up of meat or fish (or an Italian academic). When looking up Punch Romaine, I learned that it was based off a recipe from a famous French chef, Georges Auguste Escoffier, who lived in the early 1900s and was a big proponent of alcoholic shaved ices. I owe him so much. Every episode so far has included some line akin to beginning a story or a fairy tale. This time it was the simple “tell me a story,” which Chiyoh says to Will. Bedelia’s expressions during their doomed dinner were amazing. As was the beautiful and terrifying scene where Hannibal washed Bedelia's hair. I can’t even handle what Will did to the prisoner’s body after he died. Is this a message to Hannibal, or is Will becoming too much like Il Mostro? I’m hoping it’s the former, what do you think? I’m excited to see the Vergers again next week. Margot is one of my favorite characters to watch.